Following his parents’ ugly divorce, Jake Oliver chooses to move with his father to a remote corner of Connecticut. It is bad enough that their new home turns out to be a fenced-in dump in the middle of nowhere, but it seems that the previous owner, his dad’s late Uncle Horace, had been the local crackpot ridiculed by the community for his belief that a Bigfoot roamed the vast woodland preserve that lay beyond the property. Not everything about Jake’s new life is bad, though. His job at the local market is okay, and it doesn’t hurt that his coworker is pretty Nell Davis. But when odd things start to happen, like weird calls in the dead of night, stones thrown by an unseen assailant, and lingering foul odors wafting on the breeze, Jake starts to believe that maybe old Horace wasn’t so crazy after all. With Nell’s help, Jake is determined to make a name for himself by proving to the world that the mythical Sasquatch is alive and well and living in the woods just on the other side of that fence. 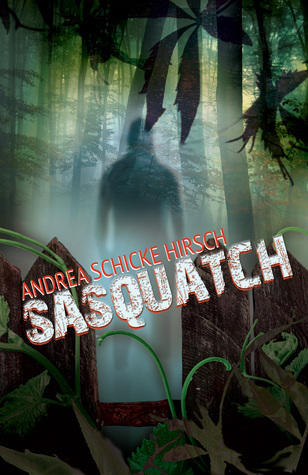 I was a little hesitant to pick up this book, because I have never really had an interest in sasquatch before. I felt like this wasn't going to be my cup of tea. However, there were actually a lot of things about this book that I really enjoyed! It was a pleasant surprise. I really liked the author's writing style in this book. I thought the writing flowed really well and the dialogue was believable. Some of the chapters were a little slow and some scenes felt repetitive, however, the writing was still good as a whole. I also was surprised with how funny this book was! I laughed numerous times while reading this book. The main character, Jake, was such a hoot. He was a spunky kid with a great sense of humor. I also really liked his friend, Nell. Nell was upbeat and I thought he was a great edition to the little gang. The one character I really didn't like was Jake's sister. She annoyed me because she was suppose to be "smart", but she constantly did dumb things like get drunk and date dumb boys. I also felt like she was a little self centered and messed a lot of things up. I didn't hate her or anything, but she definitely rubbed me the wrong way. The subject of sasquatch actually turned out to be quite interesting. I personally don't believe in sasquatch, but it was a lot of fun to read about it! I thought it was really cool how the author incorporated well known sasquatch "evidence" like the foot molds and the Peterson tape into the story. The sasquatch portion of the book was definitely entertaining whether or not I believed in it. Overall, this was a fun read that brought out the child detective in me. I would have loved reading this when I was younger along with all of my "Goosebumps" and "Nancy Drew" books.